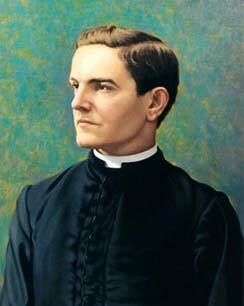 The priest, Father Michael J. McGivney, saw clearly that both Catholics and the Church faced serious problems in the last half of the nineteenth century such as anti-Catholicism and ethnic prejudice; under-employment; lack of social standing and early loss of the breadwinner. To aid one another in times of sickness or death, by means of a simple insurance plan, so that their wives and children would not face abject poverty. To strengthen themselves and each other in Faith. To strengthen families and family life. To be a strong pillar of support for their priests and bishops. To be of service to Church and community by coming to the aid of those most in need of society. They called themselves Knights of Columbus - Knights to emphasize chivalry's ideals of charity and support for Church and state, and Columbus as a reminder that Catholics had been the backbone and bulwark of America's growth and greatness from the very beginning. The State of Connecticut officially chartered the Order on March 29th 1882. It's founder, Father McGivney, and those first Knights dreamed of the day when there would be a council in every parish in Connecticut. Little could they know that their small group would grow into a global organization of more than 1.6 million members in nearly 12,000 local councils in 13 countries: the United States, Canada, the Philippines, Mexico, Panama, Guatemala, Puerto Rico, Dominican Republic, Bahamas, Cuba, Virgin Islands, Guam and Spain. In the years since 1882 the Knights of Columbus has become one of the largest and strongest life insurance companies in North America with more than $43 billion of insurance in force. More than $4 billion in new insurance is sold annually and last year the Order paid $124 million in death benefits to the families of deceased members and $275 million in dividends to insurance members. 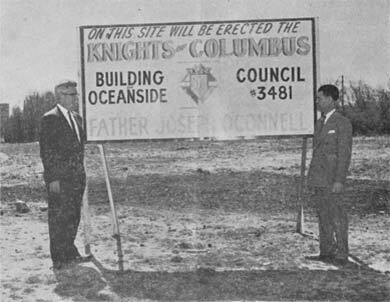 The story of the Father Joseph O'Connell Council #3481, Knights of Columbus of Oceanside, is a story of many successes of good people working together. In 1951, a number of members of St. Agnes Council, Rockville Centre, who resided in Oceanside, realized the need of a Knights of Columbus Council in a fast growing community such as Oceanside. At an annual Ushers Dinner at St. Anthony's Parish it was declared by these few brothers that steps to be taken to gather information to form a Council in Oceanside. Andrew Hickey became the first Grand Knight in February 24th 1952. Under G.K. Hickey many committees were formed, committees that not only helped to raise needed money for the Council but that also brought together these fine men working to further the principles of our order. Father Barrett, beloved Pastor of St. Anthony's Parish offered much help and encouragement to these few men. The good Father supplied G.K. Hickey with a list of 100 names of men that he thought might be interested in joining the Knights of Columbus. When it was decided by the membership in 1952 to name the new organization "Fr. Joseph O'Connell Council," Father Barrett was very pleased and donated $250 to our Council thereby starting our building fund which is still very active. He knew Father O'Connell and worked together with him to build the Grotto at St. Anthony's which became a tourist attraction. 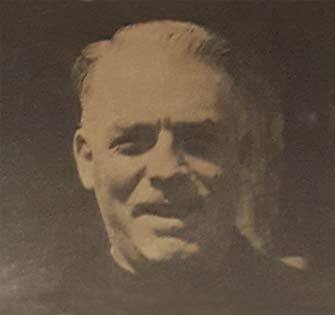 The most Reverend Bishop Molloy in 1937 appointed Father Joseph O'Connell to serve as curate to Father Barrett. A graduate of St. Francis Xavier High School in Manhattan, and Georgetown University, Father O'Connell was an All-American football star and also played basketball. After studies were completed in Theology at St. John's Seminary in Brooklyn he was ordained at St. John the Baptist church in Brooklyn in May 1934. Father O'Connell formed a Catholic Youth Organization in Oceanside to guide the interest of our young towards sports thereby preparing them to meet the challenges of life in the future. Serving the Parish well, this good priest was taken ill in 1941. He was transferred to Camp Molloy in Mattituck, Long Island, where he served as director. On July 18th 1949 Father Joseph O'Connell died of cancer while in residence at St. John's, Riverhead. This good priest left his mark on our Parish and on the entire community. As never before this Council began to have a tremendous impact on our community Father O'Connell became respected by all in Oceanside and throughout the state. Our Christian Principals, our striving for the Brotherhood of Man. As St. Paul said to the Corinthians: "There are in the end three things that last, Faith, Hope and Love & the greatest of these is Love." That day in 1952, when Grand Knight Hickey rapped the gavel and called the first meeting to order, was not the beginning, but an extension of our Christian teaching. Brothers, this is really the Beginning.